On this web page I'll take you on a tour of how to build a volcano model. As with all of the techniques on this web site the model building techniques revolve around creating a safe and or non-toxic structure on which a lizard or tarantula etc. can climb or bask. If you're building a volcano model for a school project then this volcano might be even easier and quicker to create as you're not having to worry about a living creature making this volcano it's home. The last step of applying a non-toxic sealant is essential to creating a safe environment for a pet lizard or tarantula. Even if you're not making this volcano for a living creature, you might want to think about sealing it anyway. The sealant will protect the model volcano and thus make it last much longer. 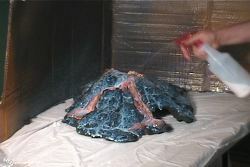 Be sure to check out the -how to build a model volcano video below. It describes in detail what text cannot offer. The best way to get ideas for making your volcano is to go on a volcano tour. Seeing a real live active volcano up close can definitely get the creative juices flowing. Since that's probably not going to be possible -you might go to the library or check on the Internet and do a search for volcano pictures and lava pictures. As the volcano video above demonstrates, you want to ideally get away from creating a perfect cone shape as you often see when people build model volcanos. Real volcanos are quite lopsided, asymmetrical and quite strange looking. You could always purchase one of the various volcano kits available in stores or on the Internet. But many of you are reading this because you're required to build a a volcano model for a school project, if that's you then continue reading or check out the volcano video above. The first step I take is putting on a dust mask. The dust that can emanate from Styrofoam and grout powder is definitely something from which you want to protect yourself. 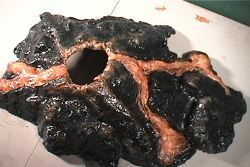 For a list of materials it took to create this volcano model visit the FAQ page for more details. 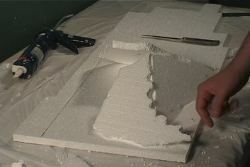 I first started out with several sheets of polystyrene -which is styrofoam purchased at a local hardware store. I then proceeded to cut out various oblong shapes of triangles. With the use of tiny thin nails I placed these crudely cut out triangles in the pattern of a wide cone. I eventually switched to using a certain type of adhesive called Locktite power grab. After creating a basic cone I proceeded to build up the landscape so as to make it asymmetrical. One side of the volcano ended up being longer with a lot more jagged rocky sections. 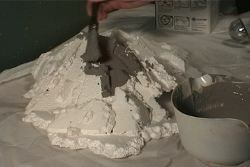 Be sure to check out the how to build a model volcano video above. After the structure was completely built I applied three layers of non sanded grout. The grout is what actually makes the structure look more like actual rock, in this case volcanic rock. After the three layers of grout were applied -I mixed up a very thick batch of grout to create the molten lava flowing down the volcano model. Once the grout dried I continued to the painting stage. I used what I call the "poor man's paint gun", which consists of a dollar store water bottle, water and in this case a certain amount of black/dark gray acrylic paint. The trick is to make sure the consistency of the mixture is thin enough to work its way through a water bottle. Next I moved on to applying some detail. 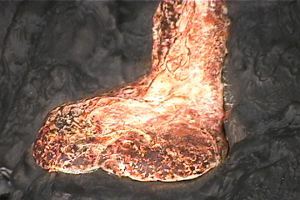 The lava consisted of four different colors applied in layers. First I started with an extremely light yellow covering the entire lava flow form. Then I moved on to a dry brush technique that could really only be understood by watching the volcano video above. At first I used a bright orange, and then moved on to a darker red. I finished the "lava look" with a fragmented application of black which conveys the idea that the lava is cooling. 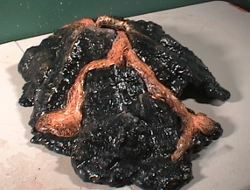 After the lava was painted I used the dry brush technique over certain sections of the volcano model to accentuate the texture of the model. I then proceeded to seal the volcano model with a non-toxic acrylic sealant called Shields All. If you are creating this for a living creature you want to apply at least four layers of sealant. 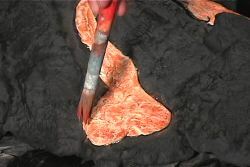 As a last stage I sprinkled a fine grain black sand on the volcano using the sealant as an adhesive. This is done to give a lizard or tarantula traction, and also counteracts the shinyness that a sealant can leave behind. Be sure to watch the video above on how to build a volcano model, as seeing the process happen can sometimes provide a better way of teaching than just reading about it. Have A Great Story About making a model Volcano?